Gala Events Facility is nestled in Marietta, Georgia and near a large Jewish Community. We have been fortunate to be able to rejoice with many families over the years as they prepare and host Bar/Bat Mitzvahs at our facility. When a boy or girl turns 13 years old, they are recognized by the Jewish Community as having the same rights as a full grown man. This ceremony and time in their lives symbolizes that he or she becomes morally and ethically responsible for his/her decisions and actions. The ceremony incorporates many years of study for these individuals to learn the language, learn the religious beliefs and specific prayers. There are several steps with each individual must go through before reaching this point in their life. I have been honored to learn about this religious ceremony and have enjoyed and marveled at the ability of these youngsters to be able to read and speak in Hebrew. It has truly been an honor to be a part of these ceremonies. I believe it is a great learning opportunity to learn about other cultures and beliefs. I hope that if you ever have the chance to attend one of these events, you will do so. 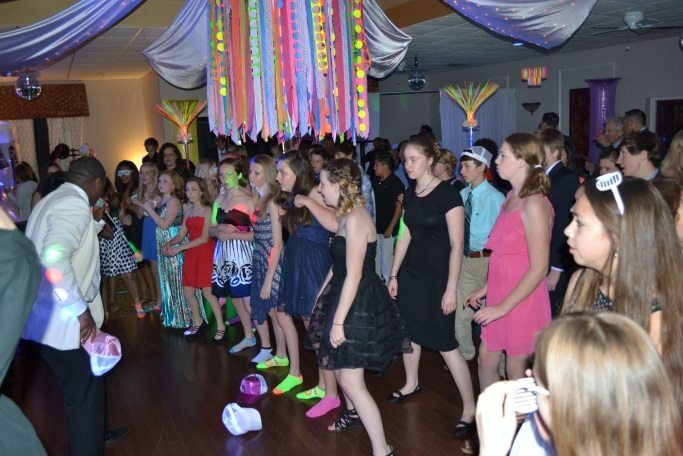 I also wanted to share a picture taken from the party of our last Bat Mitzvah last weekend. It was a great time and everyone had a lot of fun! If you are planning on hosting a Mitzvah or other event, don’t hesitate to call us so that we can arrange a tour of our facility and show you all that we can do to help you have the event you want!